Hi folks. Ya, ya, I know. Where the heck have I been right. I’d like to tell you I’ve been sailing around the world or laying on a beach in Hawaii drinking fruity drinks with umbrellas served by hot pool boys. Yet that would be such a lie. I mean those are fantasies not reality folks. Reality bites. Seriously…they even made a movie about it once. So if you’re a loyal reader you know we’ve had tons going on. It has not eased off to say the least. My aunt is in palliative care and I try to visit as much as I can. I know it’s what my Dad would have wanted. For those who know me well then you know I took care of my Dad for 8 months during his illness. He opted to be at home so I was his primary caregiver. So I have much empathy for my cousin right now. My aunt wants him 24/7 and I can so relate to it. It’s hard but it’s times like these that families should band together and help one another out. So I go and visit her. She does not know who I am. I think she thinks I’m just a really nice nurse who spends hours walking her around in her wheelchair. Which is okay, if she’s happy and content that’s all I care about right now. There’s been tons of other “life stuff” happening as well. I won’t overwhelm you with it. Honestly you’d think I live in a soap opera right now. It’s the stuff writers would give their souls to write about. I have every faith things will shift soon and the little dark cloud that follows me around will move to someone else for awhile. Just use an umbrella folks so it does not find you next. Moving the horsey this weekend. So excited. Cannot wait to be in a new, clean, beautiful barn. Big stalls, huge arena, great care. It’ll break the bank I’m sure but she’s 24 and deserves a nice place as she ages. Hopefully we can make it work financially. It’ll be worth it if she’s happy and well cared for. I’ll post pics when we move. This place is amazing. Which is good cuz we all may have to move in there with her if hubs doesn’t line up a new job soon. Just imagine a horse, 4 people, 3 cats, one loud puppy and 6 chirping birds sharing a stall. Sounds fun right. Okay so this is a sneak peek at something. I am posting the dough now. I shall post the pizza I turn it into in the next post. But I was just chomping at the bit to get this up here. I tend to get a little crazy with my pizza dough from time to time. This one is killer. You’ll love it. Place all ingredients in your bread machine baking pan in order listed. Place your baking pan into the chamber and lock it in. Select the “dough/pasta” setting on your machine. Mine takes about 2 hours. Remove from baking pan when finished. Put in a glass bowl or container and cover it. Let stand for another 30 minutes. Now it’s ready to knead out and make pizza. Edit- Hey folks, a reader just let me know I hadn’t added the yield to this. Sorry about that. Nutty time right now. This will make 2 normal crust pizzas or you can stretch it out and make 3 thin crusts. Hope that helps! LOOK AT ALL THAT DELICIOUS SPICE! DON’T YA JUST WANNA MAKE PIZZA NOW? YOU SHOULD, IT’S SUPER DUPER EASY! I’D SHARE MINE BUT…SERIOUSLY….HAVE YOU MET ME….I DON’T SHARE FOOD! Miss you guys oodles and bunches. Sorry for the lack of commenting but I just have not had time. Things should mellow soon and I can squeeze in some time for visiting you all. Until then make some pizza. Seriously, so easy to make your own. Endless possibilities…just like life!!! « A Big Old Helping of Gratitude! Holy yum!! Dude, you should add to your business and open up a pizza shop (I added the little "dude" in there for you)! You stressed me out reading about the number of animals you have! Oy vey! I was just thinking about you wondering how things were going! Glad you are back and you brought something yummy. 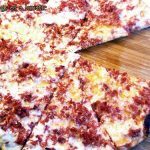 I am game for anything pizza, so I have saved this recipe-all those spices tells me this is so flavorful it will even have my husband eating all the crust-he normally doesn't eat the outer edges. Wishes to you for a few rays of sunshine to come through that dark cloud! @Tina- Aw, thanks so much my dear. I've missed everybody so much. Hopefully I can squeeze in a couple hours a day to return to normal. I love playing with pizza dough. It's just fun to jazz it up a bit. Let me know if your hubby eats the crust. I can relate to him, I never eat mine. Kiana did stuffed crust the other day and I still wouldn't eat it. Lol! You're in my thoughts and prayers; not just for the care you're giving but for your own health and welfare. I'm loving that pizza dough. I've been making my own of late and don't think we'll ever order out again. Even something as simple as sausage and pepperoni (which we had last night) is too easy not to make at home. And here you go you spiced it up with your pizza dough. @The Mom Chef- You are so sweet. Thanks for your kind words. I shall be okay, more worried about my cousin. I totally agree. Making your own pizza so much better. Not always cheaper but sure tastes better. We eat pizza way too much. @Curt- Thanks, hope you like it. @Dzoli- Thanks my dear. It's much needed time off. Hopefully now I can get back to semi-normal. @Ramona- Thanks so much. Parents aging is rough. I've lost both mine so best advice I can give is spend lots of time with them. Enjoy and treasure that time. @Kankana- Thanks so much. This definitely pops. @Lizzy- Thanks my dear. I think this one is a winner. Yes! You're back! And, Yes! I believe you … killer pizza dough, bookmarked! The last pizza dough recipe I tried out was so sticky, I lost half of it to my fingers and tabletop (annoying). I like the idea of using the bread machine. Things always work out in the end …. chin up! Hey – I was just thinking about you recently. Happy to read your post but sorry to hear about some of the things happening. I'll be praying for you. The pizza dough looks awesome. I love anything with chili flakes. I will look forward to the pizza. Hey Kim Bee , I hope you're well and good 🙂 Been missing your post and I coundn't wait when you cook that pizza dough ! I've missed you….the pizza dough looks amazing and I can't wait to see what you did with it. It is so sweet the love and care you're giving your aunt. As always – you're in my thoughts. hi Kim, I can relate about being a caregiver with your dad, I also become one and it it really need a lot of patience and love for the elderly, just to think that we will be like them too, so just make sure that we can give the love they need. Happy to read your blog. I cant believe that I never thought of doing this one your a true genious in cooking! 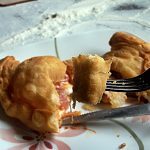 I make dough every Sunday, divide it for pizza fritta, regular pizza and calzones… and here I never added anything to it! Your right I cant wait to make it, your dough is perfect looking I love it! KIM…a lots of love sign on the dough with flour 🙂 it's mean that you are carring and loving person just like what you have done being caregiver,to all your family,Hope everything will be better soon,,,,by the way,the killer dough looks amazing. Ooooh, sounds interesting! 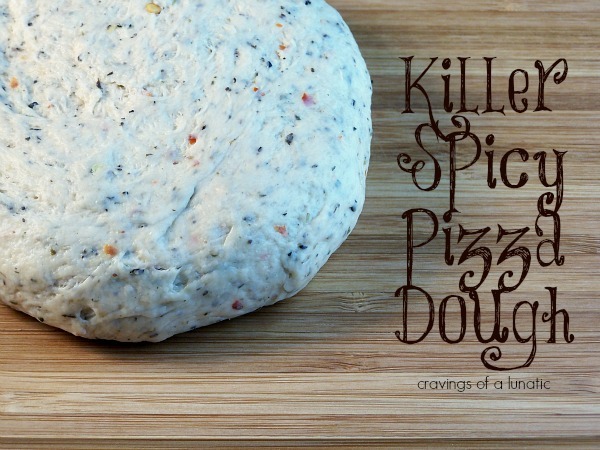 Never added anything to my pizza dough spice-wise, this seems like a very cool idea. Thanks! So glad to have you back, although I know there are plenty of important things to tend to. Thank you for gifting us with this awesome pizza dough. I love that the dough is spicy…usually a quick shake of red pepper on the pizza is good, but I think this one *pardon the expression* takes the cake. LOVE, LOVE, LOVE this pizza dough!! What a great idea of flavor the dough! Sorry for all the family stuff you are toing through. You are a great person to be there through it all though! 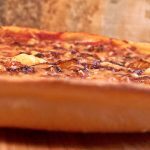 As for the pizza dough, hubby and I have been looking for a good pizza dough recipe. This looks killer good! Definitely printing it out and definitely buzzed. What a great idea. We love spicy. The last time I made pizza dough I added parmesan and it was great. Red pepper flakes would be a great addition! Sending good thoughts and prayers your way. It takes an exceptional person to care for others…family or not. The pizza dough looks amazing and I can't wait to see what you do with it. We are so glad to have you back, Kim! Your family is so lucky to have you! Now, this dough is genius! 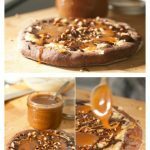 I have never even thought about adding spices to my dough and I think I SO need to try this next time!! Wow! Very creative way to even further enhance the flavor of a pizza. It would be great to design a complimentary sauce or one that contrasts with the flavors infused in the dough. Endless possibilities! why have i never made spicy pizza dough before? why don't they sell it? do they and i'm missing out? dear lord i have to find out immediately! or just make some right now. Sorry to hear about your aunt, sending good thoughts your way. From the sound of this recipe, I think I should always have some of this pizza dough on hand! This is such a great idea! I can't believe I never thought of spicing up the dough! Great idea! I've missed you…. the pizza dough looks wonderful! So sorry to hear about your aunt. It's so wonderful when family sticks together. I love the look of this dough. I can only imagine how good this pizza is going to taste. I was just thinking today I needed to try my hand at making pizza dough…this will be my first recipe! I'm sorry your family is still going through a hard time. I hope things start to turn around soon. But your pizza dough looks tasty and I really love the "flour drawings" Can't wait to see the pizza!!! Your life sure has been a journey!! We have missed you. I think I make try this spicy pizza dough. My hubby would love it! What a great idea! I've never tried baking spices directly into the dough before. I'll have to give this a try. Hey folks, I am reading these. Just super busy. Be around tonight to respond. Thanks for the wonderful response to this one. Yum! I love making homemade dough-in fact, I've got some for pretzels in my bread maker right now! Thanks! Hoping that the dark cloud moves away soon! My husband's grandma passed away just recently, and it took all of our energy to deal with it…I feel like I've been sad for a month straight. I have faith that things will get better for you–hang in there! Hang in there and good for you for being there for your family – too many people don't do that. 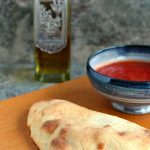 The pizza dough sounds yummy and I will definitely be giving it a try! This sounds awesome! A definite on my to-do list, just as soon as I'm up and running in the new kitch. I <3 anything spicy and pizza! Sorry to hear life has been so heavy praying for lighter days. And the pizza dough looks amazing I can just imagine the smell of it cooking~! This dough looks wonderful! My hubby may like the idea of crushed red pepper in the dough! Thanks for posting! Found you from VB members to remember! Hi by white flour do you mean ap or bread flour? Hi Robin. I mean All Purpose. I should make a note somewhere on the blog about things like that. Any time you see me just use “flour” as a general term it means AP. There are a few recipes where I use different ones but I always state what they are. Hope that helps. It’s a wicked good pizza dough but definitely has some kick. This recipe looks like tons of fun. I don’t have a bread machine though & I’m not interested in buying one. Do you have directions for this pizza dough without a bread machine. I’d real lime to make it. Hey Megan, just seeing this now. You can totally make this in a stand mixer with the dough hook. I’ll be posting a pizza dough recipe next week (I can’t remember which day right now) that is all by hand. So keep your eyes peeled for it.